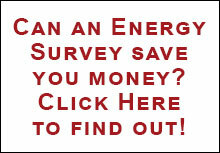 Continuously operating fluorescent lights is cheaper than turning them off for brief periods. Turning off fluorescent lights saves energy, extends overall lamp life, and reduces replacement costs. Fluorescent lighting became popular during the 1940’s when electricity costs were low. Design and manufacturing compromises in these early lamps caused them to burn out more quickly if switched on and off daily. Consequently, many companies left their fluorescent lamps on day and night. The electricity consumed–given the extremely low rates at that time—actually cost less than the labor and materials needed for lamp replacement. However, much has changed over the last 50 years in the world of lighting. Technology advancements and increased electricity costs have prompted the lighting industry to rethink the conventional wisdom of fluorescent lighting system operation. Modern fluorescent lamps use little starting energy Turning them off helps them last longer and lowers lighting costs. Many consumers believe that it takes significantly more electricity to turn on a fluorescent lamp than to operate the lamp for long periods. But researchers at the U.S. 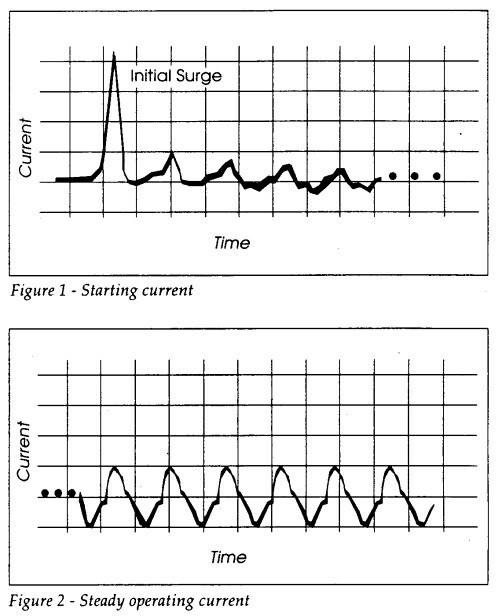 Naval Civil Engineering Laboratory have found that the initial starting surge lasts only 1/120 second (see Figure 1). The entire starting current for a two-tube rapid start lurninaire lasts for less than one second before it stabilizes (see Figure 2). Consequently, the Navy engineers assert that turning the lamps off for only one second saves the energy required to turn them back on. Today’s fluorescent lamps will run more hours if operated continuously, but they will last for many more years if they are turned off when not in use. A standard rapid start fluorescent lamp can run for 34,000 hours if left on 24 hours a day, 365 days per year. This equals 3.9 years of roundthe-clock use. By turning the lamp off for 12 hours a day, lamp life decreases to 30,000 hours because switching the light on and off wears out the filament. However, the lamp’s overall longevity isrlengthened to 6.8 years because those 30,000 hours are spread out over a much longer period of time. After a certain point, however, both lamp life and total longevity will decrease if the light is frequently switched on and off. Not only does turning off fluorescent lights reduce lamp replacement costs, it also reduces electric bills. For example, turning off an F40 lamp for only one-half hour a day can save about $4.00 (based on kWh) in energy over the life of the lamp. In fact, the money saved by this routine is typically more than the price of a new lamp. Regardless of operating patterns, overall lighting system costs can be minimized by replacing lamps as a group when about 25% have failed (see The Value of Lighting System Maintenance, Lighting Bulletin No. 1, September 1992, MI-101838). 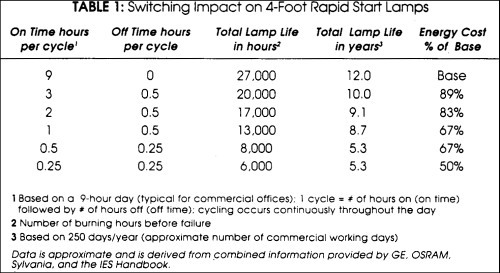 Lamp life for various “on times” and “off times” (see Table 1) must be balanced against energy use and the average number of times the lamp is switched on and off during the day, as well as maintenance and lamp costs. Because electricity is the most expensive factor in total lighting costs, it is almost always more cost effective in terms of lamp life and energy use to switch lights off when they are not needed. If a room, such as an office, will be unoccupied for as little as 5 minutes every hour it is usually more economical to turn the lights off while the room is vacant. In some situations where lights are frequently switched on and off, it can be more economical in some cases to leave lights on, at least for a certain period of time. For example, in a restroom, where the lights are turned on and off every 5 minutes or so, it may be cost effective to leave them on. But if the lamp life is weighed against the cost of the energy used, the most economical solution is to leave the lights on for 10 to 20 minutes before turning them off. This strategy can be enforced by programming an occupancy sensor to leave lights on from 10 to 15 minutes before switching them off again. Rapid start lamps and instant start ballasts are commonly used together to maximize energy savings, but this combination may actually shorten the lamp life. In addition, installing these components with occupancy sensors can often yield disappointing lamp life compared to systems using rapid start ballasts. These component combinations should be thoroughly analyzed before installation. Incandescent lamps are much less efficient at converting electricity to light than are fluorescent lamps. Therefore, turning off incandescents in unoccupied rooms can save considerable energy, particularly with higher-watt age incandescents. Further, frequent switching only mildly affects incandescent lamp life. Most high intensity discharge (HID) lamps – mercury vapor, high and low pressure sodium, and metal halide – have dofferent operationg characteristics than florescent or incandeesant lamps. For example, HID’s take several minutes to start and warmup ( although some instant-restrike models are available) and must cool after they are turned off before the ballast will restart them. A good rule of thumb is to turn off HID lamps if they are not needed for 20 minutes or more. If education programs and switch-mounted reminders do not sufficiently change user behavior, occupancy sensors and building management computer systems can perform switching tasks automatically. For more information, refer to EPRI’s fact sheet, Occupancy Sensors (BR-100323). “Turn Off the Lights!” Naval Construction Battalion, Port Hueneme, CA, Tech Data Sheet 80-01, January 1980. “Switch the Lights Off!” M.S. Rea, Lighting Design Application, December 1986. “Lighting Controls for Managing Energy,” ]. Friedman and DE. Weigand, Lighting Design Application, February 1992. IE5 Lighting Handbooks (2 vols. ), Illuminating Engineering Society of North America, 1984, 1987. Advanced Lighting Guidelines: 1993, Electric Power Research Institute, TR-101022-R1, May 1993. The Lighting Bulletin beams is one of a series produced by the Electric Power Research Institute (EPRI) Lighting Information Office. Other Bulletins are available by calling The number below. The Lighting Office also distributes EPRI lighting materials to member ut|1ities——Including fact sheets, brochures. and technical reports. EPRI. founded in 1972, conducts a far-reaching collaborative research end development program on behalf of the nation’s electric power industry.